We do not charge for the day you pick up the animal if this occurs before 11am. We do charge for the day your pet is dropped off. Why not ask about our loyalty scheme? For every two paid days, your pet gets a stamp on your card. 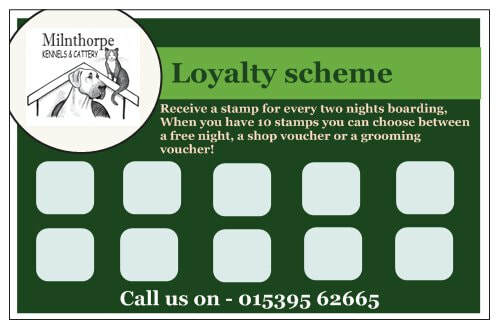 When your card is complete, this entitles you to a free night's stay, money off the shop or money towards dog grooming. For a pair of dogs sharing on full board this could be worth £27 ! Food is not generally included in the cost of day board. If you wish to bring your feed for us to give to your dog whilst staying this is an additional £2.50 per feed per day. These four days in the year we close for intake and collection. We also charge extra for animals staying these four days. For example: A dog staying over Christmas and new year from the 24th Dec to the 3rd Jan (morning collection) would be boarded for 10 days = £175. The period would include Christmas Day, Boxing Day and New Years Day and therefore would be and extra 3 x £8.50 = £25.50, with a total bill of £200.50. For example a cat on insulin at 9am and 9pm every day would be charged 50p x 2 per day = £1.00 per day. If you are supplying supplements within pre-prepared bags of food and you do not need us to make sure that the animal has consumed the supplement, then we would not charge this as a medication charge. 50% Deposit may be required when booking (normally for new customers). Cancellations within 7 days of the booking can be charged at 50% of the booking total. No shows can be charged at 75% of the total booking. Please ring or email with any questions regarding prices or any animals not listed here.